Why is holding a baby so joyful and healing? I've had the pleasure twice in the past several days: one a sleeping infant and the other, a feisty five-month old. One a beautiful, angel-faced girl, the other a juicy, sweet-faced tot with loads of dark hair. When I held my niece for the first time, we just settled in, comfortably. I had forgotten: the peacefulness; the soft, pearlescent skin; small sighs and coos, the unique scent of a baby's head; the moist lips and searching gums, exploring and waiting for mom; how their miniature bodies fit into the crook of your arm. How close they are to perfection. How close they bring one to Spirit. As I held the younger, I whispered while she was sleeping: "Remind me what it's like." Her calming presence did, indeed. My plea was based on the story I once heard about a toddler peering into the crib of a newborn, asking the same question. The farther we are from birth, the more removed we may seem from God. Often, we need something soft, cuddly and new to remind us – a baby, a kitten or puppy. A few days ago as my body was silently aching, my 14-year old reached over and began massaging my back – unprovoked. It was such a loving, unexpected gift and reminded me of the healing power of touch. Not dissimilar from holding the babies. God's touch/reach is never as far as we imagine. This morning's Henri Nouwen online meditation focused on the loneliness of Christ and the isolation Jesus felt on the cross when he uttered "Why have you forsaken me?" When Jesus came close to his death, he no longer could experience God's presence. He cried out: "My God, my God, why have your forsaken me?" (Matthew 27:47). Still in love he held on to the truth that God was with him and said: "Father, into your hands I commit my spirit" (luke 23:46). The loneliness of the cross led Jesus to the resurrection. As we grow older we are often invited by Jesus to follow him into this loneliness, the loneliness in which God is too close to be experienced by our limited hearts and minds. When this happens, let us pray for the grace to surrender our spirits to God as Jesus did." While we may need a soft reminder of God's presence, we are assured that Spirit is always with us ... perhaps too close to see, feel or experience, but present nonetheless. • What does holding a new baby, kitten or puppy touch in me? • How does that bring me closer to Spirit? • How have I experienced the power of touch in my life? • When has God been so close I felt alone? • How can I hold experiences of Holy closeness when I do forget or can't feel it? It hit with a thud the other day, though it's been rattling around awhile forming. Probably even an unexpressed thought at some point, that's how it works with me. Now it's starting to sink in, taking root. I am supposed to live based on God's direction in my life; not my own, or worse, not in comparison to others. The comparing is killing me. I don't even know when it started and am so entrenched that it's hard to spot. Our culture insidiously promotes it, creating a source of anger, jealousy, self doubt and host of other evils. Awareness, however, is a great detective. I don't drive a Mercedes like the guy at the gym. Or have a skinny body like the woman next to me in yoga. I don't rush to a cushy, prestigious corporate job or possess a degree beyond a bachelor's and minute of ministry [let me tell you, that was hard earned!] I don't live in a McMansion. I'm not famous, beautiful or particularly confident ... when I make those comparisons. I am not successful by material, or the usual American, cultural standards. I'm not, I'm not, I'm not. I am tired of living with a deficit and ready to embrace abundance, gratitude and my gifts instead of the shiny allure of so-called Western success. I am often reminded that choosing a creative life [well, it chose me] forces one into a realm apart from the cultural norm. It's a special place not for the feint of heart or unimaginative. The path can be difficult and lonely; much like the spiritual path. They are one and the same for me. Creating as the Creator. Is there a better role model? Frankly, I don't understand how one can live any other way. I, apparently, can't. I felt chewed up and spit out after joining Corporate America once. Now it's time I honor this life, my life. I am experiencing abundance, though not in the form I or society would have expected: not by my own hand. 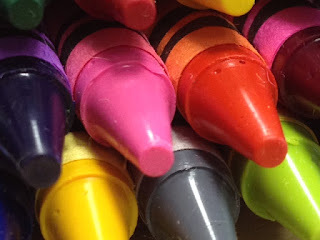 Instead from the generosity of others: two Quaker organizations funding my creative-nurture studio and under-served kids' art exploration and, more recently and closer to my heart, the 173 packs of crayons so many neighbors, friends, members of my faith community and, even strangers, donated. They will be distributed to the 150 kids who live in the complex where we'll offer an arts sampler program registration. I wanted to give each one something, a gift for creative expression, even if I can only accommodate about 16 in the arts program, nurturing them all academic year. I smile when I recall the giant box an older couple in my Quaker Meeting walked out to my car. It contained 60 packs of crayons! The generosity is astounding. In a time when I would have expected to be taking on a job and stashing money away for my girls' college, I find myself knee-deep in developing an arts organization with no salary. This is where God wants me and I have no fear that I will receive whatever it is that I need. I have so far, including a rousing example of living into the Mystery of Spirit. A dear friend and mentor recognized her business was consuming her and opposing the very reason she created it. When regular channels broke down, she gave it away. Gave it, I said ... to people who needed it and she walked away RELEASED. I felt the power of Truth when she related the story. She's helped me re-set my barometer, turning it away from financial gain and toward happiness and being right with God. I am re-penting, re-directing and setting my compass toward Spirit. And, right now, my heart sings of all the things I am and can do. The "nots" are banished. • How do I let God direct my life? • What tools do I use? • How am I swayed by cultural norms? • Where can I find a mentor, example or support? • How can I make my heart sing? This is highly unusual: sitting down to write and really struggling with something to say. I prefer to be moved by a topic rather than to manufacture one. That is also the essence of my challenge in life; to live into the mystery yet not miss the small, daily moments. To follow God's call, but be practical in carrying it out. To dream, then to follow through. When to wait and when to act. When to listen and when to speak. I can become absorbed in other worlds or too busy in this one. I'm certain you know the dilemma. In this case, my case right now, I think it's the busyness that's taking a toll. If anyone had suggested I'd be knee-deep in getting an arts organization off the ground at any time, but in summer with kids home, I'd have balked. Yet here I am. Organizing a registration event. Soliciting donations. Assembling and seeking guidance from an advisory group. Chatting with the police chief. Writing grants. Winning grants. Setting up a studio. Hoping I don't have to move it. Gathering supplies. It's not my usual, more contemplative, rhythm. I am tried, bone tired. Yet also exhilarated at what's transpired and is unfolding. I haven't made much art save three turtle boxes and almost forgotten what it's like to hold a pastel. When I look again, however, I see I am creating something bigger on a larger canvas. Not a single painting or box, but a place, a concept, a program, a way of being. But there has got to be spaciousness, balance, room for both, not either/or. I miss my regular walks to yoga because of shuttling kids or stormy weather. Held hostage inside by insanely soaring temperatures and matching humidity, disconnecting me from Mother Earth. Space. Silence. A listening heart asking "God, what's the message right here, right now?" It's about being a hollow vessel: broken, chipped and less than perfect. But, being a willing vessel, longing to be filled, overflowing so others may drink. Letting that living water spill out, but also savoring some for myself. Drinking, refreshing. Being brought back to life again and again and sharing that with others. Not even looking at the page as I type. Blindly typing the words forming in my heart at the moment. Letting God in. Now. Sharing the message that we all need the spaciousness in our lives. The time for God. The time to renew and refresh and drink the living water. No matter where we are, who we are or what we are doing. We ALL need a drink, to be filled. And it's always available. God's constant gift. • Where am I struggling right now? • How is busyness keeping me from what I may need? • How can I create space NOW? • What's my heart saying? • How is God responding? It may be too late for Angel and Alivia, Jordan and Jihad, but witnessing how they blossomed in the art room will never leave me. In fact, it drives me to (re)create that crucible for others: kids our society may have left behind. Kids that live in subsidized housing a stone's throw from me, in my neighborhood. Kids that touched my heart with their creativity, inquisitiveness and openness. Kids that just want to be seen, affirmed and receive a touch of childhood. For some, it may be all they have. My intention is to capture that magic, helping another group tap their inner artist and awaken their self expression. Mostly, I want them to show their beauty to the world and themselves. My tenure six years ago assisting in my daughters' elementary art room has profoundly affected me and, now, my life, as I begin an arts exploration for fourth, fifth and sixth graders in my re-purposed neighborhood school classroom. I remember getting that fortuitous call from my youngest's first-grade teacher: "How would you like to help out in the art room, we have FORTY first graders with SCISSORS and ONE teacher?" My heart immediately said yes. This art teacher has the gift of bringing out the best in all children. She bubbles with infectious, creative energy. 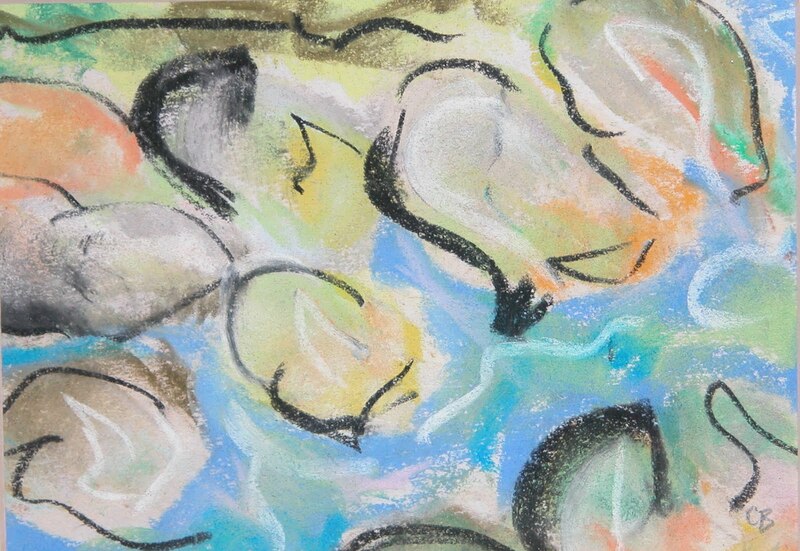 In her art room, students are all equals and, as such, expected to do their best creatively. Shy kids opened. Kids with behavior issues channeled that energy into their art. Kids that have to play adult at home, got to be a kid for awhile. Kids that felt invisible elsewhere, were seen and encouraged. Kids that struggled with academics, found a home where they excelled and where process was valued over product. Labels disappeared along with anxiety and negative identity. I don't know whether I'll be able to pull that off, but I am not alone in this work. Not by a long shot. First off, there's God who has been calling me to this for a very long time. She patiently waited until the timing was right, growing her whispers to broadcasts I could not ignore. My husband and daughters have been with me all of the way, encouraging me when I could not see the light. My Quaker community has been on board from the beginning. I have been the beneficiary of a number of clearness committees, when others listen for where God is working in on person's life, a congregation that has taken this project under its wings and a dear care committee. The Clarence and Lilly Pickett Endowment http://pickettendowment.quaker.org helped pay rent and the Good News Associates http://goodnewsassoc.org offered up a grant to cover supplies. Both are Quaker-based. I have a dream team of an advisory/action committee whom God collected. Their gifts are over-flowing into this work. They include: the incredible art teacher who started all of this; another fabulous teacher who regularly visits this community on her own time; my recently retired sister-in-law with whom I have been aching to do something creative; my best friend and able facilitator (she makes things happen); a longtime Quaker pal who has been with this before I even knew what it was; an enthusiastic, wise-cracking neighbor with a big heart and non-profit/ministry background; and a newcomer with lots of energy and grounding. And I can not forget the Quakers and Facebook friends, neighbors, family members and acquaintances who have donated crayons so each of 150 kids at this complex receive a pack when we host an arts sampler/registration for Artsy Fartsy Saturdays next month. Three months ago, none of this was in place … except in the heart of God. Wow, I can’t even take it all in. • How have I seen seeds planted by God grow? • How have they been watered and nurtured? • What others has it drawn into my path? • How has the heart of God opened to me? • How has that transformed me? Over the weekend, I had the privilege of introducing a non-swimmer to the water for the first time and it was exhilarating for me. I can’t, exactly, speak for her, but she seemed relaxed as I left her … floating. My body rather loudly hinted Saturday afternoon that it needed a swim, so I complied by grabbing my suit, goggles, towel, flippers and gym bag, then filling my water bottle and heading off. I brushed past an older woman in the locker room in my overly focused anticipation of laps. It does create in me a bit of obliviousness. I hit prime-time swim lessons, but an empty lane beckoned. They always leave one open for lap swimmers … thankfully. As I was nudging my form-fitting fins on and adjusting my scratchy-lensed goggles, I heard the metal door squeal and noticed someone returning to the locker room. It was the lady I had brushed past, leaving because the lanes were full. As I rounded the deck on my first length, I also realized another swimmer had just vacated the lane for me and was drying off. I asked if she’d kindly tell the woman who’d left that I was happy to share. My preference is not to share an already-narrow lane as my shoulders are wide, though ideal for swim strokes, and often sore. Scrunching them to accommodate a second body is not so relaxing. And yet, the thought of another doing without tugged at me. Turns out the sharing was more than amicable. She was recovering from back surgery and walked the shallow end and swam the deep. As expected, her rhythm was much slower than mine and we rarely met. On a selfish note, it’s difficult to find my groove when I worry about colliding. I managed to find it, only to gently clip my companion. I apologized and she giggled. I finished first, did my gentle stretches, then asked my cohort if I could offer my half of the lane to the young man and woman waiting. She was agreeable. When I approached the couple, he explained that they’d been watching me as he was giving her instruction. This was her first day in the water. Apparently she was a dancer from Indonesia and uncertain of her body when it was buoyant. They were eyeing my flippers, so I offered them to her. Her coach lit up, saying it would probably make it so much easier. After his pep talk, I convinced them to harness her in a flotation belt; they’re the best place to start. She also wanted a couple of noodles. I held her hand as she sat down and the edge, hopped back into the water and waited, arms outstretched, as she launched herself into the deep-end corner. After a few panicky breaths, I heard them even and I knew it would be okay. Her coach got in and started working her strokes and I knew it was time to leave. She seemed to easily be managing the flippers, making her way where I had just swum. I left, my whole being in a smile, because I understood a secret. When you learn to float in water, it’s a lot like surrendering to God. Floating is the process of trusting enough to relax your body into the wetness, but also keeping your core strong. And so I left her … floating and dancing with my flippers. • What is an early or first experience of water? • How easily did I trust? • Who was there to help me? • When have I done so for another? • How do I surrender/float to God? If someone had predicted a year ago that I'd be studying astrology, I'm not certain I would have believed them. I didn't have a real grasp of what it was or what it could reveal. Only knew the horoscopes in the daily paper that rarely echoed my life. I am still far from absorbing much of anything, however, am beginning to see its function as another venue for knowing oneself more deeply. There are many lenses through which to view the alignment of planets: emotional, psychological, spiritual, vocational, physical, with regard to relationships, our place and path in the world. I had no idea this key opened so many doors. I am privileged to have been introduced in a spiritual context by a talented, wise teacher whom I trust. Her spin is archetypal astrology with a somewhat Jungian base. That may be why most in our small circle are students of Jung. I am only at the fringes and was somewhat intimidated by that fact upon entering our first meeting last winter. That's all vanished as we devour the monthly lessons lovingly and carefully prepared. We are there to learn PERIOD. Not judge or waive credentials. That had been my baggage. There are so many layers that our teacher thoughtfully doles out one at a time. Often, we clamor for more and she is always prepared. I froze in truthful recognition when she handed out my list of oppositions, the number of planets in my birth chart that lay 180 degrees from each other. Seven, the page spewed at me. We had just been digesting that these opposing aspect are the places we are challenged and must find balance. I felt the room's collective gasp as I understood why, time and time again, I scream out: "Why am I always fighting myself?" It was an odd sort of affirmation that shone light on the truth, but, at the same time, released me from laying it on myself. That's just how it is PERIOD. Yesterday, I spent some time researching some of these oppositions on the internet, especially Cancer-Capricorn, which has been termed the axis of structure and the spectrum of: mother-father, parent-child, abandonment-security, giving-receiving, emotional comfort-self sufficiency and nurture-discipline to name a few. Upon closer examination, these look like a combination worth embracing, not fighting because, when balanced, they can work quite effectively together. For example, something I read said that it often takes discipline to nurture ourselves. BINGO, that's what I do every day, sometimes begrudgingly. I must swim or do yoga daily, take heaps of supplements, use my sinus rinse and spray, refrain from wheat or gluten and dairy ... the list seems endless just to get out of the door. Sometimes, I just want to chuck it all for those I see running a comb through their hair and a brush through their teeth and are on their way. But that is not me or my condition. The daily regimen is and it works for me because I have both the discipline and self-nuturance to do so. In this area, I have discovered balance. Previously, it seemed like a chore. Thanks to the bits I am learning about astrology, I can acknowledge and be grateful for this opposition in my life. Even begin to ask God to help me find all the places that could be more harmonious. • When has something unexpected opened me to self wisdom? • What experience do I have of meeting truth head on? • How have I reacted? • What are some of the oppositions in my life? • How do I seek divine guidance to balance them? Today, as I was wiping the dust and cobwebs off five 1938 theater seats, I realized that how everything I have been collecting – items as well as lessons and experiences, even people – is playing a part in my current endeavor of opening a nurture studio and offering under-served kids an eclectic art exploration. I bought this first row of seats from the Miami-Western Theater in Oxford, OH, in a thrift store shortly after the theater closed, probably 20 years ago. They took up residence in our cavernous Loveland apartment with French doors and hardwood floors and no occupants for 30 years. They’ve since been stored in our garage attic, taken out once or twice for parties. More importantly are the people: my best friend, a neighborhood friend with a background and ministry in non-profits, my favorite art teacher, my beloved sister-in-law who just happened to recently retire (I have wanted to partner with her in something for so long), my longtime spiritual and Quaker buddy and two gifted teachers who heard what I was doing and quickly and thoroughly threw in. I am overwhelmed at the support. It means I don’t have to go this alone; there are actually people who desire to help in this. My Quaker meeting is just waiting to know what I need supply- and people-wise. Never had I dared to dream this dream. It’s not one college or society prepares you for or even, really, explains is an option. Serving God in whatever way she calls is, I believe, my most important work. It had felt as if I’d been fighting it until a breakthrough the last few weeks helped me see and accept –– this is BIG for me – that I am exactly where I am meant to be. Certainly I have heard that repeatedly over the years and thought I understood. Just wasn’t ready yet. I am not fully there, but it is washing over me and sinking in as if to permanently stick. I had been moving in this direction when, at a recent Quaker retreat, a Friend lingered to deliver a message that moved something out of my path and projected me into another frame. I wrote about it last post [http://salonforthesoul.blogspot.com/2012/07/remembering-i-am-loved.html]. He talked about the yes-and-no-language of God, of doors opening and closing and how often, for him, the closing was much more pivotal, though devastating to his ego and perception of what his work would be. I was riveted when another Friend spoke in worship about seeing dark spirits leave people, then witnessing the healing and transformation. I was so intrigued that we had an extended conversation because I had never been able to speak to another Quaker so candidly about the darkness. Most prefer to dwell on and in the light. He gave me some practical advice and some scripture to read – only because I was hungry and asked. Fortunately, I had my monthly pastoral/shamanic-counseling session scheduled several days after I returned and, again, could talk to someone I completely trust. Gary couched this idea of dark spirits differently, as twisted love. He helped me expel some of that: a process we have worked on for years, but not entirely in this new frame. He told me the negativity that has attached to me can be sent to another realm, where it will get what it needs to become love again and cannot return to feed on me. So, we propelled it. We touched foreheads, he patted my hair and gently sang to me. I was transported somewhere other-worldly and remembered who I am without those old, dark attachments. Remembered not to compare myself to others, not to hold myself to what society esteems as successful or even where my ego had me trapped. I continue to remember and am beginning to understand why I have been collecting what I have been collecting. I am collecting what God calls me to collect and doing with it what she directs. • How have I experienced doing something for no apparent reason, but doing it nonetheless? • What’s it been like when I have realized there is a purpose? • How can I see God’s hand in my life and work? • How easily can I let go of other notions that fill me about who I am and what I should be doing? • How do I let go? Last week, I packed my girls and myself up, dropped one off at Quaker camp, then, drove the other with me to a wonderful Quaker retreat week we’ve previously attended. We arrived at dinner. I warmed up to the query that evening, “How do you confess God’s goodness?” and received an answer, though was not prepared to give it yet. I think it was a warm-up for what would happen during Bible study the next morning. One well-known and loved Friend and his wife were aiming to leave after breakfast and we’d hardly crossed paths. Except that he felt he had a message to give and he remained to voice it. And it hit me like a ton of bricks. I can’t recall his exact words and he was much more eloquent, but the essence was about doors opening and closing in our lives and living into the yes and no of where God is directing us. Re-penting, he called it. Re-directing. That word, repent, has been with me several weeks when I encountered it elsewhere and began to open to its true meaning. This faithful Quaker talked about God’s two arms, the yes and no, directing us where we belong. Often, we look at the door closing as failure, he said, but, in his life, it is a turning toward God even if the circumstance seems less than ideal. SHAZAM, my body started slowly rocking, absorbing this deep message. I instantly knew that 14 years ago a door permanently closed, moving me on a closer walk with God. However, until that morning on the porch of Stillwater Meeting in Barnesville, OH, I hadn’t realized that I keep trying to re-open that door. A door that is supposed to remain closed and my attempts to re-enter only divert my energy. I was beginning to loosen my grip and relax into this wonderful news. It spoke to other friends, who shared how. I, finally, was led to say that what was happening was beyond words, involved tears and I felt the need for companionship. Without hesitation, warm arms emerged in an embrace as the tears streamed and my body rocked. It was the best hug I’ve ever received, as if God herself was giving it. We touched for quite some time. I’m not really sure how long as time stood peacefully and comfortingly still. When worship broke, a pure and loving soul walked over and draped us in a colorful shawl. He said it looked like we needed it. Finally, my companion and I traded names, though we knew we’d met on some deep and inexplicable level. And, as grace would have it, Connie was soon leaving. Most of the time in the following worship, my body shook, dare I say quaked. In another time, another place, I would have stopped it. I knew that I could, but I didn’t want to, not even for appearance. I understood no one here would question any of it. That’s how safe it was. The only other time I’ve experienced that physical sensation was after delivering babies. My body and teeth shook and chattered; a response, I suspect, of release. To me, it seems that simple, though not always so easy to carry out. Now, I have a memory of a tangible, other-worldly embrace to help me remember I am loved. • When have another’s words really opened me? • How has my cry for companionship been answered? • How have I been comforted by God? • How does that experience sustain me? • How do I confess God’s goodness?